New for August, the Diverse Children's Books linkup has added a suggested theme. For August 6th, the theme is Diverse Books for Back to School. To that end, I'd like to share my all-time favorite book for kicking off the school year and emphasizing diverse themes right from the beginning. 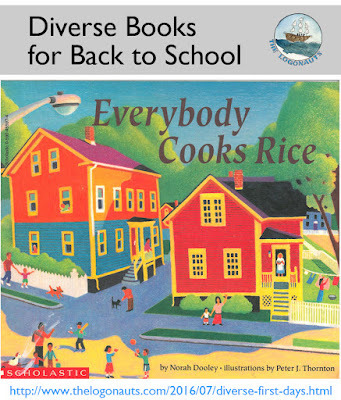 Everybody Cooks Rice (1991) by Norah Dooley focuses on one afternoon when the main character chases her little brother around the neighborhood, popping in on various neighbors to look for him. At each house that she visits, the reader is introduced to the family, their various ages and occupations, the language(s) spoken, and the rice-based dish that they are preparing for dinner. For the past eight years, this has been my First Day of School read aloud to my third graders. Our curriculum is based around geography and world cultures, and our reading theme for the first month is looking at Communities and Cultures. I love how this book compresses the "global village" into one small neighborhood and how the focus is on commonalities among all of these families. There is also some socio-economic diversity highlighted, as the parents work a variety of jobs including long hours. Every child I have read this book to finds personal connections to at least one of the families or meals in the story. I have even had kids ask to borrow the book and take it home so that they can try cooking the included recipe! This is part of a series of similarly-themed books by the author, including Everybody Brings Noodles, Everybody Serves Soup, and Everybody Bakes Bread. I think I have this in my library, but had never read it. I'll give it a look. Thanks! It's cute with a great message! All kids eat so food is a great way to highlight commonalities! Love the global village idea and focusing on a neighborhood. What a great message. Thanks, Patricia. I really think it helps bring home the message that diversity is everywhere. This looks like a lovely series! Thanks for sharing.